Climate change is a bigger threat to elephants, tigers and the rhinoceroses than poaching, a wildlife expert says. Dr Richard Leakey told BBC News global warming, combined with decreasing ranges, could make the animals extinct. He has convened a seminar at Stony Brook University near New York, where he is calling for the establishment of a new global fund to protect wildlife. 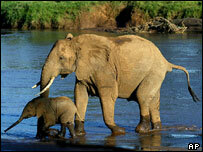 And the former director of Kenya's wildlife service believes concerted action is needed within five years. Millions of dollars are spent each year to keep iconic species such as the elephant, the tiger and the rhinoceros safe from poachers, principally inside protected areas such as national parks. Dr Leakey believes this could be money wasted. "We can spend money trying to stop poaching, but there's no point in doing that if the stuff in there is going anyway," he told the BBC News website. I think we may well be looking at a mass extinction; and I think the question is, can we do anything to adapt to it? "If the concern is symbolic species, there may well be a bigger threat from climate change than from utilisation and poaching." Predicting the regional impacts of global climate change is not an exact science; but in Africa, home to the "big five"' symbolic species - elephant, rhinoceros, lion, leopard and buffalo - computer models predict that overall, areas which are currently dry will become even dryer as well as warmer. In pre-industrial times, animals threatened by these changes could simply have migrated, but human development means that option has largely disappeared. 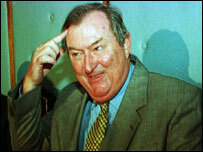 "Protected areas are now islands," said Dr Leakey. "The wildlife and fauna and flora are pretty well tied in by boundaries which aren't oceans, in the sense of islands, but development. "And if there's significant climate change, as is predicted, what's going to happen to these areas? "Paleontologically, island faunas become extinct." In an attempt to find solutions, Dr Leakey has convened a high-level three-day seminar at Stony Brook University near New York, where he is a visiting professor. He will attempt to convince representatives of bodies such as the World Bank and the United Nations Environment Programme (Unep) that they should set up a new fund of around $100m to research the issue, and find ways of protecting wildlife from climate change. "I've long been concerned that whilst people are talking about climate change, and talking about the implications for future society vis-à-vis health and agriculture, very little has been done to address what this could do to protected areas around the world," he told BBC News. "I think we may well be looking at a mass extinction; and I think the question is, can we do anything to adapt to it? "Are there new land-use regimes that could be put in place which would extend the possibility of some of these ecosystems getting through a climate change era? "Are there things that could be done artificially that would make it less likely that we would see extinction? Should we visit the whole issue of ex-situ as opposed to in-situ conservation? "There are an awful lot of people around the world who have lots of ideas on this, but nobody seems to be addressing this in a co-ordinated way."